Sometimes you wake up in the morning and the only way you can imagine starting your day is with a nice piece of toast with smashed avocado on it for breakfast, maybe with some lemon juice or chili flakes for good measure. The craving for avocado toast is just a fact of life at this point, but we’re so saturated with restaurant options that it can be hard to decide where to go for this most Instagram-friendly brunch item. Here’s a brief list of the very best avocado toast in Boston. This funky brunch favorite serves up some of the most creative avocado toast in the city. The Friendly Toast offers two options for the now-classic brunch dish: one with corn salsa and feta and another with mixed greens, a sunny-side-up egg, and garlic aioli. Both options are served on whole-wheat toast and come with a fresh fruit salad. For a higher-end take on avocado toast, head to the Tip Tap Room downtown for their weekend brunch served between 10:30 a.m. and 3 p.m. While a bit pricier, this avocado toast comes with fresh basil, marcona almonds, a poached egg, and cherry tomato. Tip Tap Room’s brunch also features an impressive beverage menu, so you can start your day off however you see fit. 138 Cambridge St., Boston, 857-350-3344, thetiptaproom.com. Alden and Harlow has been dishing out modern American fare to a young Cambridge crowd for years now. Chef Michael Scelfo’s take on avocado toast is a bit more substantial than most, with torched avocado, poached egg, crab, and kalette kimchi for that extra burst of flavor. Try it yourself during the restaurant’s weekend brunch. 40 Brattle St., Cambridge, 617 -864 -2100, aldenharlow.com. This New York vegan chain has spread its wings in Boston with great success. Opting for simplicity over flash with its avocado toast, customers will be treated to a hearty seven-grain toast with smashed avocado, almonds, and a mix of seasonal greens. Pair this with one of the many fresh pressed juices on hand and you’ll be more than ready to face the day. Danish-inspired Cambridge newcomer Vester Café focuses on doing a few things really well with a simple, clean menu of sandwiches, salads, and breakfast items. 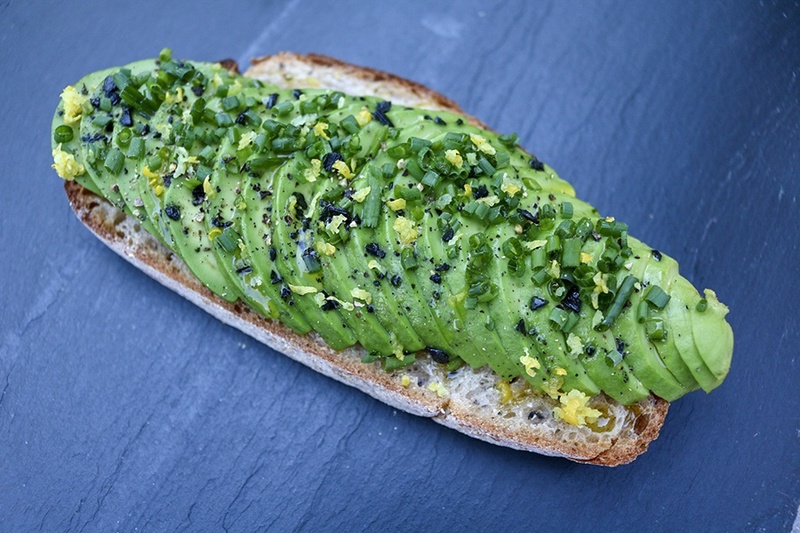 The café’s skipper Nicole Liu has hit upon one of the best straightforward avocado toasts in Boston, with avocado, chives, Cyprus black salt, and lemon zest for just $6. You really can’t beat that deal, and the entire menu is available all day long if you weren’t already convinced. 73 Ames St., Cambridge, vestercafe.com. No list of brunch food of any kind would be complete without a mention of Deep Ellum, the Allston gastropub that has been slinging its eclectic fare to the neighborhood for over 10 years. The weekend brunch menu includes a zesty avocado toast with pickled mustard seeds and za’atar. Diners also have the option to add an egg to their toast for an extra hearty start to the day. 477 Cambridge St., Allston, 617-787-2337, deepellum-allston.com. This Somerville bakery opened its doors in 2014 and has since gained a reputation for excellent house-made breads, pastries, breakfast food, and sandwiches. Forge Baking Company’s delightfully minimal avocado toast is no exception, with salt, pepper, and olive oil on house-made Danish Rye toast. Pair that with the Intelligentsia Coffee on hand for a much-needed boost in the morning. 626 Somerville Ave., Somerville, 617-764-5365, forgebakingco.com. There’s a reason Tatte has found so much success in Boston. Founder Tzurit Or has managed to provide the perfect combination of a well-rounded brunch menu, excellent coffee and baked goods, and a warm, inviting atmosphere at every Tatte location. The avocado tartine here includes baby arugula, dill, radish, and poached eggs on toasted house-made sourdough.